In a saucepan, bring water to a boil. Add beans; cover and cook for 3 minutes; drain and set aside. Place bacon on a microwave-safe plate and microwave on HIGH for 2 1/2 to 3 minutes or until edges curl. Place six beans at one end of a bacon strip. 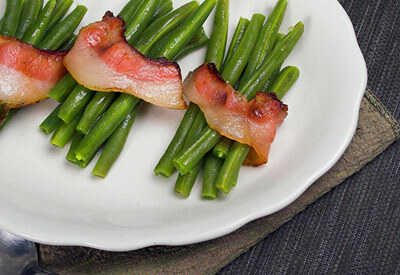 Roll so bacon wraps around beans and end of bacon is facing down; repeat. Place bundles in an 8-inch square baking dish. Drizzle with salad dressing. Bake uncovered for 10 to 15 minutes or until beans are crisp-tender. If crisper bacon is desired, broil 4-inches from the heat for 2 to 3 minutes or until bacon is crisp after initial baking is complete.